A variety of political developments could lead to a military confrontation between the United States and China. What would a war between the two colossi look like? The intensity, duration, and course of a war in Asia depend on the war strategies pursued by both adversaries. Talking about the war strategy of only one combatant is only half the story: the enemy gets a vote. In particular, prospects for escalation and intrawar deterrence require consistency between the war strategies of the combatants. American and Chinese strategists are choosing from a small menu of three or four basic strategies. For the US: ‘distant blockade’, ‘maritime denial’, and ‘deep strike’; for China: ‘near-seas defense’, ‘regional bid’, and ‘hegemonic bid’. All of these terms are cartographic. We shall now make them more precise. 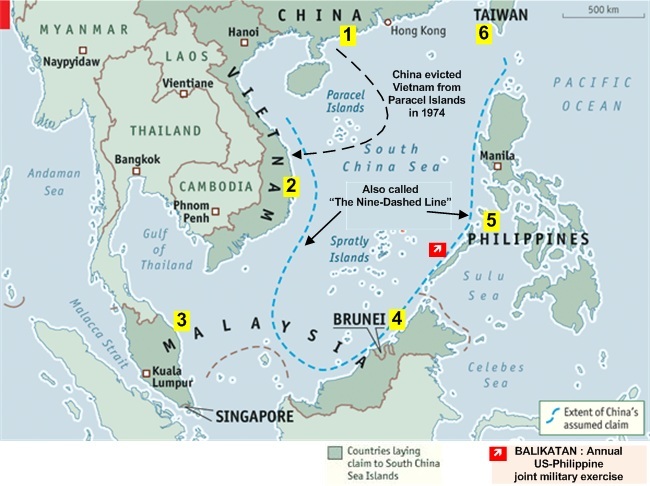 The US war strategy distant blockade means that in the event of a confrontation, rather than engaging directly with Chinese forces, the United States would use its control over the Strait of Malacca to impose a naval blockade. The cumulative economic pressure applied on China would be harsh but slow and steady thus greatly limiting the potential for escalation. Maritime denial is a more aggressive war strategy that seeks to deny China access to Asian waters. With the Chinese navy locked up in the near seas, the US and its allies would be able use the maritime zone outside the first island chain for communication and shipping. China’s marginal seas would become a ‘zone-of-fire’, where access is denied to both by the adversary’s ability sink all surface assets at will. Archipelagic defense is a variant of maritime denial which relies on placing US ground forces on islands off the Chinese mainland to bolster the US navy’s efforts to deny China access to Asian waters. In either variant, the punishment would be severe whilst still limiting the risk of escalation since China’s second-strike capability would not be undermined. Deep strike is the most aggressive of the three war strategies being considered by US planners. It evolved from strategic concepts developed in the eighties by Pentagon planners concerned with thwarting a Russian land invasion of Europe under conditions of mutual nuclear deterrence and an American monopoly on precision strike. Known as the concept of AirLand battle in the late eighties, it was reformulated as AirSea battle for the defense of maritime Asia, especially Taiwan, against Chinese aggression. Deep strike seeks to cripple the adversary’s ability to project its power. Deep strike calls for a wholesale destruction of China’s ‘reconnaissance-strike complex’. The US would seek to destroy targets deep in mainland China in a bid to cripple China’s anti-access, area denial capabilities. Mainland targets would include command and control facilities, air and anti-air installations, space and anti-satellite equipment, radars and surveillance infrastructure, and missile launch platforms. But deafening and blinding China and destroying its ability to launch missiles undermines China’s second-strike capability. China’s government may then face a ‘use it or lose it’ situation. Deep strike thus poses significant risks of escalation. Now consider the military strategies available to China. For the sake of brevity, although the US would likely be fighting shoulder to shoulder with regional allies, we will refer to China’s adversaries in such a contest in the singular; simply as the US. Near-seas defense seeks to deny the US military access to China’s marginal seas. An initial barrage of missiles and airstrikes would target all air, surface, and undersea assets of the US within the China seas. In particular, China would not attack US military bases in maritime Asia outside the near seas, such as those in Japan, the Philippines, and Guam. 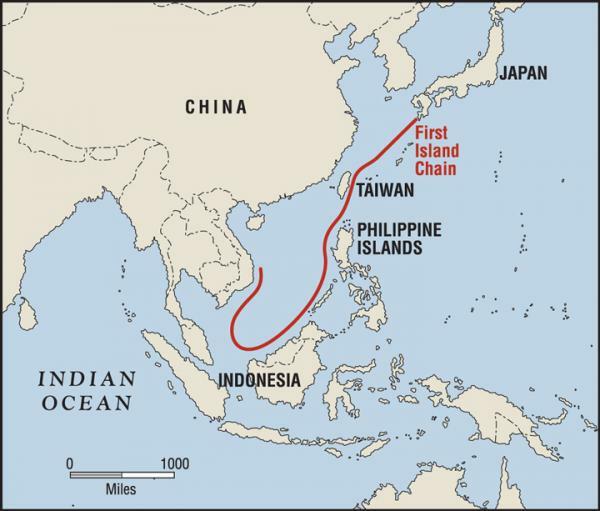 It would then establish a naval defense perimeter along the ‘first island chain’. This military strategy would leave China exposed to a local counterattack by US forces in the western Pacific, but sharply limit the probability of escalation. A more aggressive variant of near-seas defense would have the initial barrage of strikes target all US military assets and bases in the western Pacific, whilst still maintaining China’s naval perimeter along the ‘first island chain’. Given US’ force posture of forward deploying only a fraction of its strength, even a ‘splendid first-strike’ on US assets in the western Pacific would not seriously cripple the United States’ ability to mount a counterattack. And far from limiting the war, it would guarantee a prolonged campaign as the US seeks to regain its position in the region. A splendid first-strike on US military assets in the western Pacific is thus unlikely to accompany a near-seas defense. Note that the threat of a splendid first-strike is much more serious when mounted against an American strategy of archipelagic defense. A regional bid would indeed begin with a massive first-strike on US positions in the western Pacific, including Guam and perhaps Japan; crippling America’s ability to mount a local defense. China would then repeat Japan’s World War II strategy of establishing a secure naval perimeter along the entire western Pacific. The United States would be forced to rebuild its supply lines; and in the meanwhile, rely on ineffective long range platforms to attack China. Once China succeeds in kicking US forces out of Asia, it would still be exposed to a distant blockade. China would lose access to Western markets and gulf energy. There are only three ways out of the ‘Malacca dilemma’. First, growth in Asian markets coupled with a shale revolution in China could take the bite out of a potential blockade. Second, China could build up its maritime power enough to defeat the United States in open ocean combat. Third, a combination of secure land access to Caspian Sea energy and growth in Asian markets could make a blockade less painful. Given that Asia is likely to grow into at least as big a market at Europe, the Malacca dilemma calls for a western-oriented strategy that leverages China’s land power. China could seek to deny the US military access to the Caspian Sea region to ensure its access to the region’s significant energy deposits. It would be extraordinarily difficult for the United States to project power in Central Asia, given that the region is far from the open ocean. At best, the US could use long-range cruise missiles to disrupt Chinese supply lines. But these missiles would have to be launched either from bases in the Middle East or from naval platforms in the gulf. Both would be vulnerable to counter-force strikes by the Chinese. While access to energy supplies may be critical to China’s war effort, the western theater will be secondary to the maritime zone where the regional bid will play out. Rather than being an alternative, a western-oriented land strategy complements China’s regional bid. Hegemonic bid is a war strategy suitable for a Chinese bid for the highest stakes. China would seek to engage and defeat US forces operating in the open ocean. The minimal goal of this war strategy would be for China to replace the United States as the dominant naval power in the Indo-Pacific: from Suez to Hawaii. More expansively, China could seek to replace the United States as the global maritime hegemon. Hegemonic bid will only become available to China once it has mastered open ocean warfare. Since the 1996 Taiwan crisis, when the United States intimidated China by sending three aircraft carriers to the Taiwan Strait, China has sought to build what the Pentagon calls anti-access, area denial capabilities. The centerpiece of this strategy has been a reconnaissance-strike complex that allows China to credibly threaten US naval assets that approach China’s near seas. Twenty years of effort has borne fruit. China now enjoys the capability to hold US surface assets in the western Pacific at risk. While it has managed to gain some mastery over precision strike, China has not yet developed significant power projection capabilities. The Chinese navy’s ability to operate in contested environments and on the high seas is still rudimentary. China’s economy is growing fast along with its military budget. There is no reason to believe that China will not be able to dramatically increase its naval power in the coming decades. If war comes within the next decade, China will have no option but to rely on near-seas defense as the other two war strategies will be simply unavailable. By 2030, the growth in Chinese naval power should be sufficient to make regional bid a viable option. And by mid-century, China should be in a position to consider a hegemonic bid as well. The United States enjoys a very strong geostrategic position. The US homeland is protected against all but the longest range platforms of its potential adversaries. Regional allies both add to US strength and provide stepping stones to bring its power to bear in the western Pacific. In the 2000s, deep strike was a viable war strategy for the United States. The rise of China’s reconnaissance-strike complex, together with uncertainty about its nuclear posture means that deep strike is no longer viable. At the present juncture, maritime denial is still a viable war strategy for the United States. The US is in a good position to deter China from seeking to forcibly upend the regional territorial status quo ante in the near future. As China grows more powerful, at some point, perhaps within a decade, maritime denial would no longer be on the menu for the United States. And in the more distant future, say by mid-century, the United States would lose the ability to mount a distant blockade as well. The contours of a potential war in Asia thus depend critically on when it is fought in ‘system time’.